Hi, glad you like it! The only documentation available are the descriptions for the methods. For creating brand new BVH animations it might be easiest to put them together using something like Blender, although it could be possible to puzzle it together in Unity as well through the methods. It's been a while since I experimented with the tool myself. Frames could also be copied manually between .bvh files by opening them in for example WordPad, if it's just a matter of combining some parts. It's a little vague, I don't know where that error could have appeared. If you want to change the mesh of the model itself then no, MeshSkinner doesn't modify meshes. Hi! There's no difference in functionality between the demo and full version, so you can try and get it to work in the demo before purchasing. If I understand your requirement correctly it is something that should indeed be possible to do. The source code is not available but MeshSkinner should still work on iOS and Android. The DLL is what Unity calls a "managed plugin" so when you build your game for whatever platform the plugin will be included. The tool can adjust the animation in different ways but it doesn't have anything that automatically places the skeleton in a T-pose. Although it can be used to edit a BVH in detail directly via script it wasn't built with that purpose in mind. Unfortunately there aren't any videos available at this time. BvhImporterExporter (for Unity 3D) community · Posted in How can we apply the animation clip to the humanoid character? Hi, terribly sorry for the late reply. Perhaps you've been able to move on by now? All I can really think of from what you've written is to make sure the paths are correct by modifying pathToSkeletonGO in the makeAnimationClip() method and make sure the joint names match in the BVH file. As I previously mentioned before in a different thread BVHImporterExporter was never really intended for Mecanim, though it should work with a bit of extra work. I can't really help with Blender though if that's giving you trouble. Hope you succeed with your goal! Btw you're not making a tool that repackage my tool and give people access to its features, right? I mainly made the plugin to go with https://winterdust.itch.io/bvhimporterexporter in order to make modding games easier. Basically you wouldn't need to bake everything into your game but can simply read files from a folder and apply the skeleton and mesh during runtime. So modders just need to modify files in the folder without needing to use specific modding tools for your game. But it can have other uses too, for example say that you randomize a mesh in your game and afterwards want to modify it simply by moving a few points. Simply let those points act like a skeleton and use MeshSkinner to connect them with the mesh. You could also modify a mesh, for example make a character's nose bigger due to some spell cast in the game or something, and then refresh the model afterwards using the MeshSkinner. Sorry for the late reply, at the moment no such thing is on the horizon. Nice to hear that paid downloads get prioritized and receive faster speed. I just thought I'd put the torrent idea out there, a single AAA game can be 50 or 100 GiB in size these days and it's probably only a matter of time before smaller indie games reach such sizes as well. Didn't mean that itch.io should provide a tracker or seed the torrent, an open tracker can be used for this method and the developer will do the initial seeding themselves. If however itch.io provides a private tracker, generates a torrent file for each uploaded file and then start seeding it automatically (when the go-ahead is given by the account owner) that would of course be even better! It would be a bit of an undertaking to set it all up. I've noticed that larger games sometimes get a couple of comments from buyers that are getting very slow download speeds or have been unable to download their purchase at all. Perhaps itch.io will outgrow this problem in the future but right now it might become an issue for bigger companies that want to sell here. 1. Archive your product with 7zip. Split it into several files and encrypt with a password. Tick the option to make a self-extracting archive. 2. Put the self-extracting archive ("YourNameHere.exe") as well as a random 5% of the other created files into folder "PAID". Put the rest into folder "DIST". 3. Make an empty text file named "! this is the official distribution torrent, note that some data of the full release is missing here.txt" inside the DIST folder. This will prevent some misunderstandings and help reduce potential annoyed comments. 4. Create a torrent-file of DIST, use a couple of open trackers. Note: You can put an actual demo in the DIST folder to distribute that here as well if you want to. People who has bought the game can just instruct their BitTorrent client to not download the demo. 5. Make the torrent available for free on itch.io by marking it as a "demo". If the torrent does not actually contain a demo make sure to name the file something like "Warning, this is actually not a demo, this is the data distribution for release X.torrent". 6. Archive the PAID folder. Encrypt with the same password as the first step. Tick the option to make a self-extracting archive, but don't split it into several files this time. Name it "run_me_first.exe" or something like that. 7. Make "run_me_first.exe" available for those who have paid on itch.io. 8. Also make a text file named "password.txt" available for those who have paid. Put the encryption password in there, as well as some more detailed instructions on how to use the distribution torrent (you can for example mention that they can delete the files downloaded via BitTorrent after unpacking the game). Even more alternative options for downloads can be put here, FTP servers or links to dedicated web servers that hand out your content. 9. Explain on the itch.io page how this works: They download the main amount of data via BitTorrent. Then place "run_me_first.exe" with the other files and run it. Finally they should run the now-available "YourNameHere.exe". Afterwards the product is ready to be used! By using this method people only need to download a small percentage of the actual game size from itch.io, the rest comes via BitTorrent and can download at very decent speeds. If there's any pirates around chances are they will help seed the torrent as well, giving paying customers higher speed (note that this method of distribution doesn't increase the piracy threat, they would have pirated it anyway. Now you're at least getting some bandwidth from them). I hope someone finds this feasible and useful! Please check out my tools for the Unity Engine at https://winterdust.itch.io/ as well as the game JezzBall Classic. Suggestions or comments? Please share them here. If you're having any trouble please feel free to post about it here and I'll help out. 1) There might be a way but right now I haven't implemented such a feature. I can see how it would be useful though and will be looking into it if I make an update! It's likely it will be an editor-only feature though and not not available in the demo. 2) Using the Mecanim system is possible but not simple. You have to create an Animator Controller in Unity and set it up with dummy animations, which means no previews (make blank states, set their motion to any AnimationClip you've got in your project). You also prepare an Animator Override Controller (AOC). Then during runtime you replace the original dummy clips in the AOC with the real ones created using BvhImporterExporter ("bvh.makeAnimationClip(pathToSkeletonGO:"MySkeletonGOName", legacy:false);"). Finally you instruct the Animator to use the override ("myAnimator.runtimeAnimatorController = AOC;"). Sticking with legacy might be just as simple or even simpler unless you intend to do some advanced stuff. The legacy Animation system is not deprecated even though Mecanim has been around since 2012 when Unity 4.0 was released. After trying to work with Mecanim from code I understand why, the Animation system has better access from code so Mecanim isn't a replacement (yet at least). I haven't for example found a way to create an Animator Controller from scratch via code during runtime, it seems to be an impossible task outside the editor. 1) I used MakeHuman ( http://www.makehuman.org/ ) to make a model. I exported in mesh format "Collada (dae)" and made sure to select the Bone Orientation Option "Local = Global" (important/required since it makes sure no joints are rotated). 2) I imported the .dae file into Blender ( https://www.blender.org/ ) and made a little animation. I exported it to format "Motion Capture (.bvh)" and checked the "Root Transform Only" option (it isn't required but I really recommend it since it makes the BVH file smaller by removing positional data usually not used). 3) Made a new scene in Unity, it imported the .dae file automatically. I dragged it into the scene, opened up the model GameObject in the Hierarchy and renamed the skeleton GameObject to "MySkeletonGOName" (just so I can use GameObject.Find()). The skeleton is the one that only contains a bunch of transforms. 4) Made a new MonoBehaviour script and put my two lines of code in its Start() method. Could have been one line of code btw, the bvh variable isn't really needed in this case. 5) Pressed play and the model made by MakeHuman danced via the BVH animation made in Blender. It works! Blender Tip: If you go "Export > Collada (Default) (.dae)" you need to check "Export for OpenSim" under Armature Options. It removes bone rotations so that the skeleton joints become compatible with BVH. So you can create models from scratch or modify the mesh of existing ones if you want to. Yes you can! If the imported model has exactly the same skeleton structure and joint rotation as the BVH it should work just fine. In BVH all joints are always Quaternion.identity in the resting pose, in other words, not rotated. If the model imported by Unity has a skeleton with rotated joints the animation will appear incorrect since BVH base all rotations in the AnimationClip from Quaternion.identity. I tried to make a method that adapted a BVH to an already existing skeleton but it was tricky to make it work without some rotations being flipped the wrong way so I couldn't include it in the final version of the product. I'm currently working on a different product that skins a mesh from a skeleton during runtime, it'll ensure that the joints have the correct rotation. I'm making good progress but I don't know when it's finished. I recommend that you download the demo of BvhImporterExporter and see if you can achieve what you need. The most important thing is that the model's mesh was skinned to the skeleton when the joints wasn't rotated, then the AnimationClip created from BVH will move the skeleton correctly! Check your model in Unity (make sure it's in its rest pose - you can uncheck "import animation" for the model in the inspector). If all the GameObjects that make up the skeleton have Transform rotation [0,0,0] you're good to go! Assuming that the skeleton has the same structure as the BVH of course (matching bone names). Ever wanted to dynamically import a skeleton during runtime in your game? With BvhImporterExporter you can! Simply give the path to a .bvh file to the BVH class' constructor and the skeleton and its animation will be imported into the game. + Import skeleton rest pose and animation into Unity during runtime. + Several methods to help you modify the imported data to for example change the frame rate, rename bones or make a skeleton "run in the same spot". + Export the modified BVH back to a new .bvh file if you want to fine-tune it in for example Blender. + Create AnimationClips that works with both the legacy system and the Mecanim system. + Extremely fast, most animations will only take a few milliseconds to import. + Able to not import every single frame in an animation for even faster import time and lighter resource demand (useful if you have 120 FPS .bvh files but don't need that much in-game). 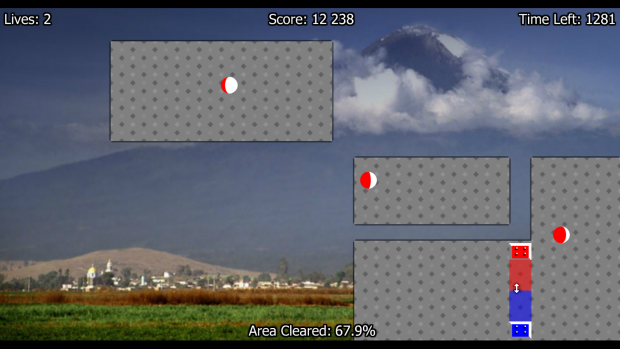 A showcase "BVH Viewer" is available (with C# source code). itch.io Community » Game Development » Release Announcements · Posted in JezzBall Classic has been released for PC! itch.io Community » Game Development » Release Announcements · Created a new topic JezzBall Classic has been released for PC! 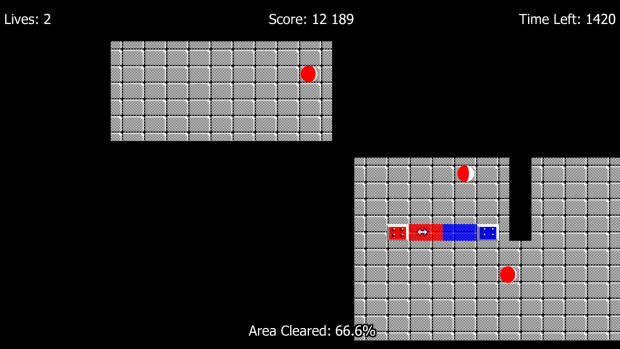 The game was created to be exactly like the original JezzBall from 1992, just with a lot of extra game modes and optional better graphics. Gameplay: A bunch of Jezz atoms is bouncing around in a capture chamber. It is your job to deploy wallbuilders until over 75% of the chamber has been filled with walls. Time your deployments correctly - if pending walls are hit by an atom they are destroyed and you lose a life! Please take a look at https://winterdust.itch.io/jezzball-classic for more screenshots and information.